The Specific Carbohydrate Diet was created by biochemist Elaine Gottschall. After witnessing her daughter’s complete recovery from severe Ulcerative Colitis with a version of the diet that was introduced to her by Dr. Sidney Valentine, she was compelled to research more about the diet and later to write about her discoveries. The publication of her book Breaking the Vicious Cycle popularized the diet and made it accessible to the public. The diet is currently being used successfully to treat sufferers of digestive disorders such as Irritable Bowel Syndrome, Crohn’s Disease, Ulcerative Colitis, Celiac disease and Candidiasis. It is also used to treat Cystic Fibrosis and Autism. The Specific Carbohydrate Diet is a very stringent plan that completely eliminates grains, lactose, and sucrose. As the title of the diet suggests the basic concept is that only specific types of carbohydrates are included in the diet. It is not a low carbohydrate diet although it can be followed as such if desired, especially if weight loss is a goal. The basic concept of the diet is that certain carbohydrates are the primary source of energy for specific intestinal microbes. Gottschall declares that undigested carbohydrates cause an overgrowth of harmful microorganisms that can produce toxins and trigger damage to the lining of the small intestine that results in malabsorption of nutrients and impairment of immunity. The diet involves eating foods that either contain no carbohydrates or only simple carbohydrates, which include fructose and glucose. Simple carbohydrates are absorbed completely in the first part of the intestine and microorganisms will not have the opportunity to feed on these carbohydrates. Disaccharides, which are sugars containing two molecules are not permitted because they take longer to break down. Sugar and lactose are disaccharides. Some types of starch are also incompletely digested such as those found in grains and potatoes so these foods must be strictly avoided. Processed foods must be eliminated as sugar and starches are added to almost all processed foods. With enough time on the diet it is expected that the normal balance of the microflora will be restored. Dieters are advised to continue with the strict version of the diet for at least six months and then to experiment very carefully with reintroducing foods. Meat, poultry, eggs, fish, oils, butter. Most vegetables except potato, yam, parsnip, seaweed and canned vegetables. Certain legumes are allowed including navy beans, lentils, split peas, lima beans, and string beans. Many other beans such as garbanzos, soybeans and mungbeans are to be avoided. Cheese with a low content of lactose such as Swiss, cheddar, colby, havarti, dry curd cottage cheese. Most fruits including apples, apricots, ripened bananas, cherries, dates, berries, grape, mango, papaya, citrus, peaches, pears. Nuts such as almonds, Brazil nuts, pecans, walnuts, filberts, raw cashews, natural peanut butter. Honey and saccharin are the only permitted sweeteners. Almond flour is used as a substitute for grain flours. Weak black coffee and tea is permitted. Breaking the Vicious Cycle, A Specific Carbohydrate Diet retails for $22.95. Buy this book from Amazon. There are several recipe books available by various authors. Recipes for the Specific Carbohydrate Diet is one of the most well known and this retails at $19.99. Eat Well, Feel Well is a the newest cookbook to compliment the Specific Carbohydrate Diet containing more than 150 recipes and retails at $16.00. Grocery bills may increase due to the cost of purchasing special foods. 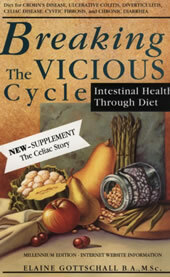 Appeals to individuals with digestive and immune disorders who have tried other dietary approaches without success. Contains a good variety of highly nutritious unprocessed foods. Extremely rigid and will require a great deal of determination for dieters to adhere to the plan long enough to achieve results. May be psychologically stressful especially for children due to the severe nature of the diet. Will significantly interfere with social situations involving food. Very difficult to eat out. More studies are required in order to confirm the effectiveness of the diet. Many patients have attempted the diet without achieving an improvement of their symptoms. Requires a fair amount of time to be spent on food preparation. The Specific Carbohydrate Diet is targeted at those individuals with the health disorders outlined above. It is not designed for weight loss and on the contrary the goal of the diet is often weight gain as individuals with digestive disorders often have difficulty with losing too much weight that is related to malabsorption. Simple carbohydrates and high fat foods may need to be restricted if weight loss is a goal. There is a need for more studies to be done to confirm the effectiveness of the diet however it shows great promise for sufferers of chronic digestive disorders who have been unable to obtain relief via other methods and dietary approaches. "I just wanted to say how great this site is. The Macro-Nutrient and Daily Calorie Needs calculators I use all the time. Thank you!" Some links are affiliate links, so if you decide to purchase a book or plan listed, you will be helping us.